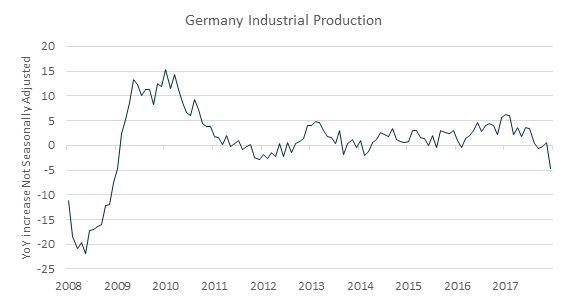 The recent fall in the industrial production in Germany appears to be larger than typical quarterly volatility. Year-on-year change was -4.8% in November 2018 – the greatest decline since 2009 (source: Bloomberg). A more detailed analysis of the business sentiment – IFO index (source: IFO Institute, Center for Economic Studies) suggests that while the declines are broad, the leader in decline is the chemicals industry. 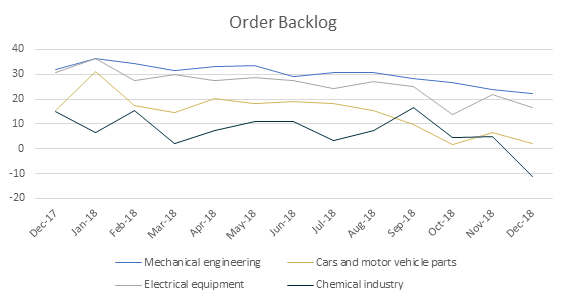 Order backlogs have shrunk most considerably in the chemicals industry, though the declines are evident elsewhere. Indeed, German chemical companies have reported poor results and reportedly expect poor 2019. As a quick first step to defining a stress scenario, we have applied a 20% volume decline for the four main industries in Germany: automotive, mechanical engineering, electrical equipment and chemicals. The scenario results are available for Mira ABM users through the Excel App or linksmira.com. Explore how Agent-Based Models (ABMs) can be used to run stress tests and scenario analyses.